Our product range includes a wide range of hi-vac major suction deluxe m-v machine. Leveraging on wide expertise, we are instrumental in developing best quality HI-VAC Major Suction Deluxe M-V Machine. Gaining huge acclamation for creating an instant vacuum the offered model is driven by energy efficient motor. 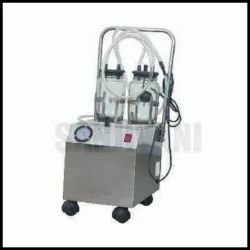 Designed as a complete stainless steel cabinet unit, the offered machine comes with two 1.5 liters capacity jars that match with the challenging demands of the healthcare sector.